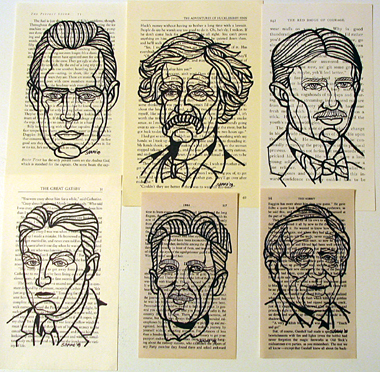 A new batch of author inspired drawings done on pages from their books. I just wanted to drop you a line as it felt funny that I had come across your page. My name is Zoe Anderson and I'm an artist from the UK. I'm working on my next piece of work which includes researching Stephen Crane (hence stumbling onto your page), whom Id never heard of before this week. Poe, Thoreau & Steinbeck Drawings!